This important show rejects conventional narratives and thematics, as well as standard modes of looking at photography as they have developed in art museums recently. Instead of leaning back and taking it all in, we have to bend down and peer closely. The viewer is given no quarter, and the installation brooks no lapses of attention. Visitors must work hard and long to divine their own meaning from either sepia smudges in tiny cartes de visite, or the fugitive sheen of daguerreotypes. There is little help from the labels which for the most part eschew the conventional narrativising comforts of extended captions (Yes, I know, we are meant to buy the book) and provide only the bare museal bones on which the viewer is required to build their own understanding. 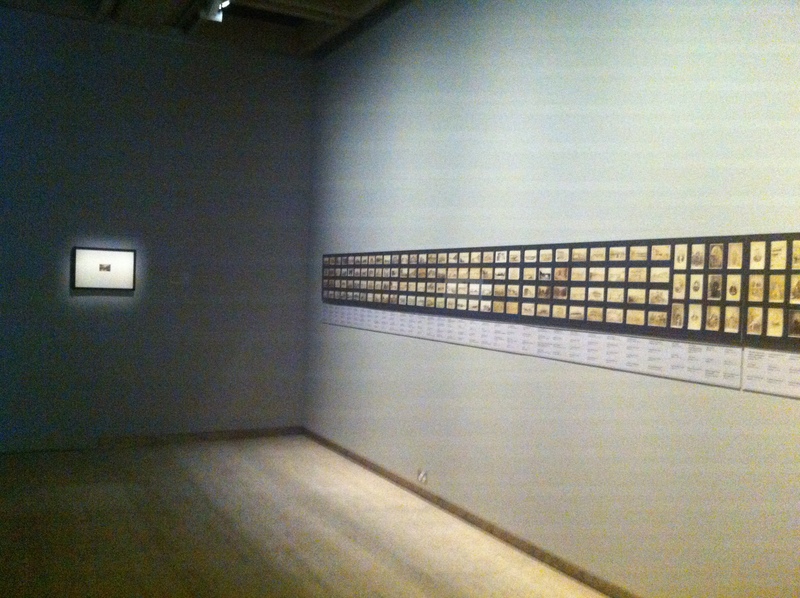 Because the show is committed overwhelmingly to the auratic power of the photograph-object, and many of its objects have faded and were in any case initially scaled to domestic or bureaucratic situations rather than museum consumption, it is up to the dramaturgy of the hang to carry the show for visitors. Its emotional pitch is set by the doleful procession of aborigines who accompany us through the galleries to its very end with Kerry’s kitschly racist postcards. In contrast the panoramas of Vaniman, which are also threaded through the show, ironically play against them like a cheerfully optimistic chorus. The architectural engine room of the show is the installation in the central void. Here the audacious curatorial strategy of using certain contemporary works to dramatically set off the historical works is most dramatically played out. In this space we can’t really look at the Moffats and the Maynards hanging above us, they are too high. As we bend ourselves to work over the vitrines, they look down at us like the crazy ancestral portraits in a haunted mansion (thanks Anne). This same reflective strategy works very well with the Ferrans in the Beattie room, where they spookily re-set the tone of the whole space. 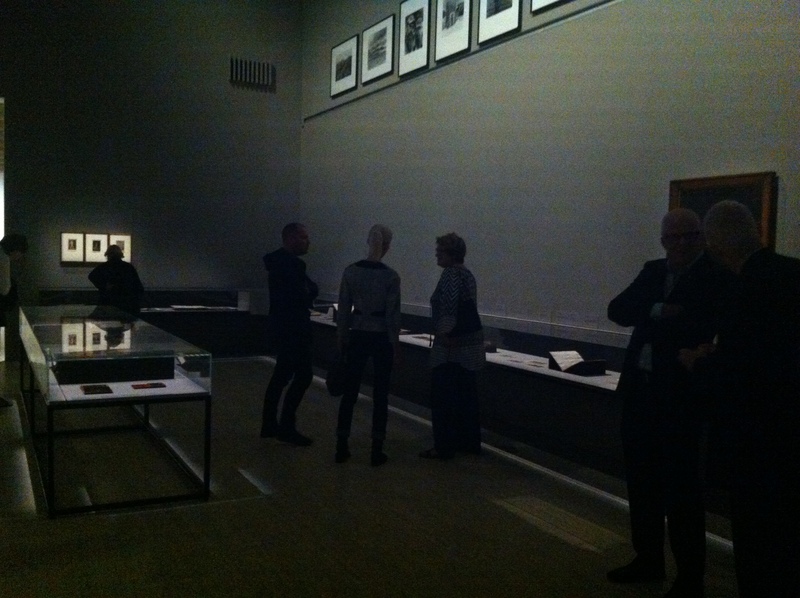 But the Laing work in the twentieth century critique section is not good enough to activate its space. The magnificent Ford installation has lot of work to do as it sits across from the astronomical photographs — two constellations of time, I guess — but this curatorial stroke also works. The vintage backlit X-rays placed between them — including the old skeletal hand with a wedding ring memento mori — are a treat, and maybe even make the Gills redundant? There are many other spine tingles to reward our labour; while some icons, such as say Cazneaux’s Spirit of Endurance, are deftly detourned with some new surprising Cazneaux images. But sometime other image clusters, such as say the one with the two Poignants and the Bishop aren’t given quite enough curatorial spin, and perhaps allow us to lose the concentration which the show makes essential. The show is committed to quantity, which it sees as the essence of the medium, thus we are not given the usual serving of one Goodman Daguerreotype, but the whole extended family of them. The auratic power of the patinated print is the show’s obsession, but it is wonderful to see the X-rays and a real, live, Holterman negative. I wish there had been other occasional ‘break out’ spaces to allow us to exercise other scopic regimes than just the ‘intense peer’. Some printed pages to touch, or some stereo viewers to look through, maybe? There I was, going through the final bank of cartes, peering at what felt like was my gazillionth albumen surface. What was it? It was barely discernable even as an image. The label wasn’t much help, it just said J Davis, Sydney, 1860s to 1890s. So this pale smudge could have been taken any time during a thirty-year period. I think, but I’m still not sure, that it was somebody’s prize fruit tree, which they were obviously so proud of they made a carte of it. It had almost disappeared but there it was still, in the AGNSW, demanding to be seen. Posted on March 22, 2015 by martynjolly. This entry was posted in Art, Blog and tagged 2015, Australian exhibitions, Curating photography. Bookmark the permalink.